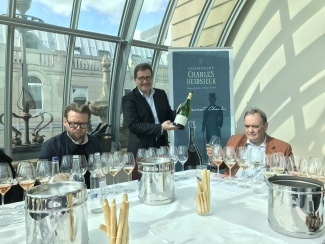 Last month, Charles Heidsieck invited us to the grand Trafalgar Room of the English National Opera for a tutored masterclass presented by Chef de Caves, Cyril Brun. 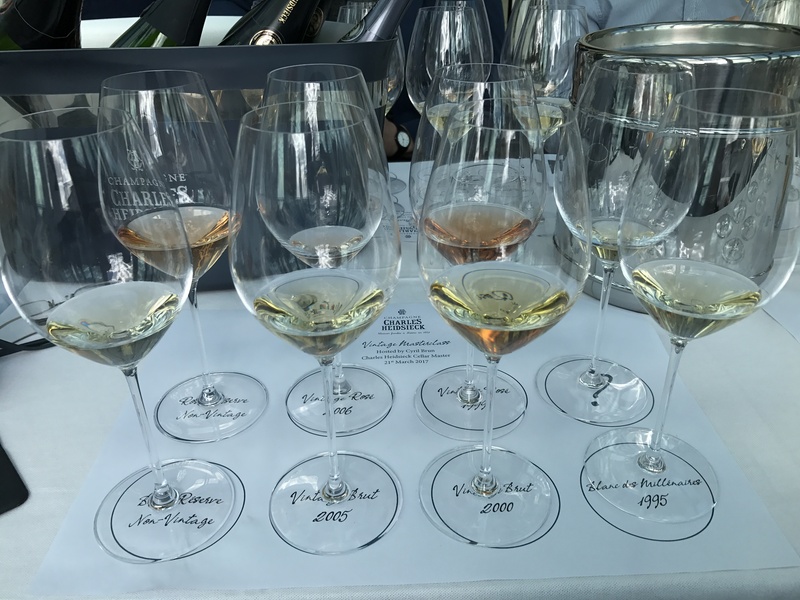 The theme was a vertical tasting of both their Blanc and Rosé range to showcase the ageing potential of Charles Heidsieck Champagne. Spanning 2008 to 1995, we knew an educational afternoon awaited, made even more insightful with Cyril’s finishing treat: a magnum of Brut Millésime 1981. A little background on the man: Cyril is a Champagne native, born in Aÿ. A business and oenology graduate from the University of Reims, Cyril’s first employment was at Châteaux Haut-Brion in Bordeaux, after which he moved to California to complete an MBA and then returned to France to help with the family business. The son of third generation winegrowers, Cyril assisted his father in the cellars and was in charge of the export markets. After a 2 year stint at the Metro Group choosing the wines for the National Wine Department, he eventually joined Veuve Clicquot as a winemaker in 2000. Cyril then spent the next 15 years at Clicquot working under Chef de Caves Dominique Demarville, before assuming his own Cellar Master post at Charles Heidsieck in May 2015. It seems the 2008 vintage can do wrong: this is simply stunning. A big nose of toasty aromas and great roundness on the palate – much power is contributed by the high percentage of reserve wines. Cyril explained that when blending the house non-vintage he looks for texture in the base wines. 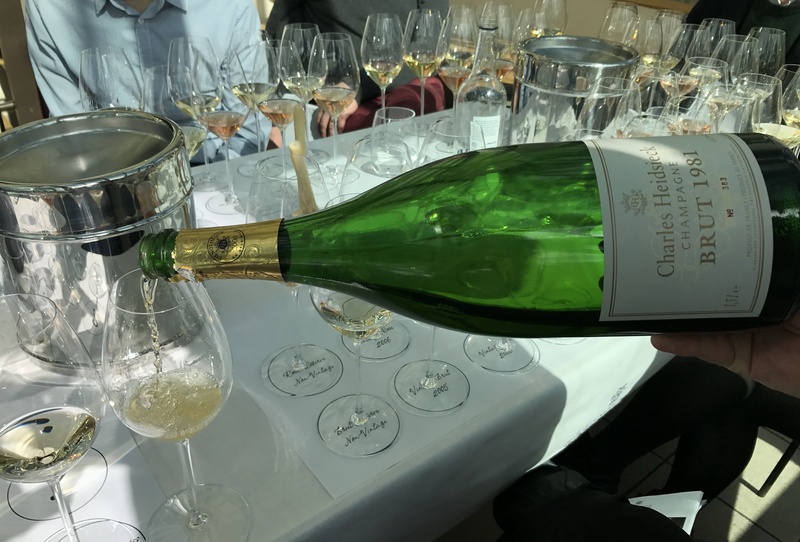 The final blend is an assemblage of 50-60 villages from Heidsieck’s total stock of 320 base wines, all of which have undergone malolactic fermentation in stainless-steel tanks. With a 60% contribution from the 2008 vintage, the reserve wine content is the maximum allowed: 40%. Cyril told us the average age of the reserve wines in the Brut Réserve NV blend is 10 years old, meaning some will be much older. A rich golden colour. Lots of yeasty bread aromas on the nose. Creamy notes starting to come out on the palate, this is both full and rich. Abundant flavours of lemon and lime, with a hint of saltiness and loads of toasted nut character. Made from only Grand and Premier Cru rated vineyards, Cyril believes the Brut Millésime 2005 matches the Charles style of opulence and richness perfectly. With a lower acidity than typical, this contains a high density of phenolics and will consequently stay very austere for a long time. This is a Champagne we are familiar with tasting, but has only really just started to develop in the last 12 months or so. It was also revealed that in response to high demand, some magnums are currently on their way to the market – watch this space for availability. Great golden yellow colour, almost hints of green. Interesting nose, loads of creaminess and nutty aromas. Intense lemon, lime and ripe red apple flavours on the palate. Loads of mushroom character and a hint of truffle. Good refreshing acidity and real depth. As we ventured towards older vintages of Heidsieck’s blanc range, this next Champagne was the most exciting yet. Again just Grand and Premier Cru wine contributes to the Brut Millésime 2000, and the blend is a typical 60-40 Pinot Noir-Chardonnay share. Aside from some early hail, the 2000 vintage was an easy growing season compared to many and the excellent maturity of this Champagne is a testament to that review. With less dense phenolic character than the 2005 and a soft acidity, this was incredibly drinkable – Cyril noted it is probably just entering its plateau phase now. Given time in the glass, it became more and more voluptuous; so rich and smoky and with slight hints of whisky character. All the characteristic creaminess and power of the 1995 vintage. Loads of lemon and lime flavours burst out on the palate. Incredible length and wonderful acidity still present. Seems leaner and saltier than previous bottles. Smoky notes began to develop when left. Very complex. 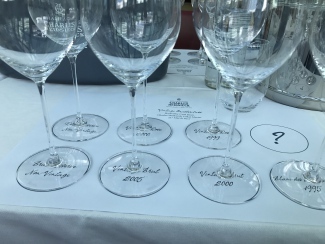 Heidsick’s prestige cuvée is named in tribute of the 2000-year old Gallo-Roman chalk cellars, in which it has spent more than 15 years maturing. Pure Chardonnay, the blend is a precise balance of 20% wine from 4 Grand and 1 Premier Cru vineyards located in the Côte des Blancs – including Avize, Cramant, Oger and Vertus. Released in 2013, this seems to be lasting forever; a consequence, Cyril told us, of the vintage needing time to express itself and previous winemaker Thierry Roset producing double the amount requested. 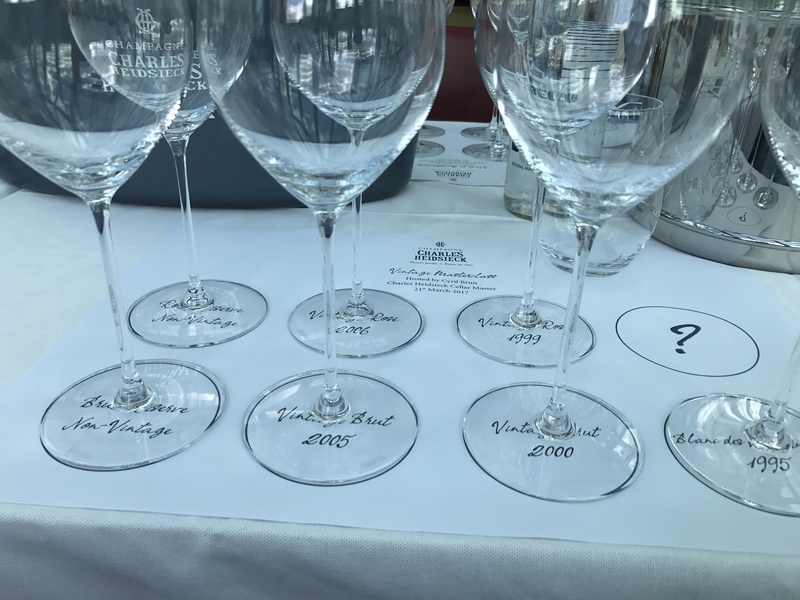 We were informed there is still some Blanc des Millénaires 1995 on lees that will constitute the final release later this year, paving the way for the new vintage. Although he did tell us that 2015 and 2016 will not be BdM vintages – the wines are going into the reserve programme – Cyril maintained his silence on what the next BdM vintage will be. Our guess is 2004, but only time will tell. Before we moved on to the Rosé’s, talk briefly turned to dosage. Charles Heidsieck Champagnes, although within the Brut category, are typically sweeter than others on the market – with most over 11g/l. Cyril commented: “Dosage protects the Champagne, so you have to consider how low dosage wines will age.” Adding his belief that dosage gets too much attention, Cyril then shared that it is a “balance of how long you are going to age, as sugar will assist with age as well as taste.” Offering Louis Roederer Cristal 1996 as an example – a relatively high dosage of 11g/l and tasting magnificent now – Cyril’s point was an interesting one well made. A hint of spice on the nose. Nice soft berry fruits, loads of strawberry coming through and some blackcurrant. Acidity makes it seem quite dry (although perhaps richness of BdM 1995 has changed our palates?). After a few sips it starts to show more fruit and richness. Slightly iodine finish with a hint of salt. 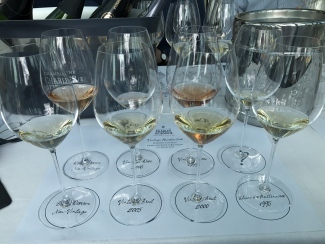 Onto the Charles Heidsieck Rosé range, we began with the non-vintage. With just 20% reserve wine, this is a much younger Champagne than the Brut Réserve NV. A whopping 80% contribution – a 50/50 Chardonnay/Pinot Noir split – from the 2008 base vintage can only be a good thing though. The reserve wine content has an average age of 5 years, and the 5% red wine content is also largely 2008, with a dash of 2007 and 2005. Interestingly, the red wine originates primarily from the village of Riceys (down in Aube) and from vineyards in the Côte d’Or, a very southern region near the border of Burgundy. Loads of ripe strawberry aromas. Some spiciness and delicate rose-like perfume. Has good richness and a wonderful mouth-feel. Overall the great fruit content stands out – heaps of blackberry, blackcurrant and old fruit cake flavours. A Champagne we are very familiar with, this placed second in our blind tasting of fourteen prestige Rosé Champagnes. Half of the 8% red wine content is again sourced from Riceys giving the Champagne a wonderful ripeness, with the other half from Aÿ and Verzy in the Montagne de Reims adding great acidity and a complex mineral texture. A much darker colour; almost amber rose gold. Few bubbles. Lots of raspberry, blackberry, mushroom and rose hip notes. This has a real earthiness, complemented by a slight hint of eucalyptus. Tasting really good, however the extremely soft acidity indicates this may be nearing its peak. As we neared the end of our tasting, this older vintage rosé was a shining example of how well Charles Heidsieck ages. Although beginning to lose its effervescence, Cyril noted it is normal for bubbles to reduce with age. On the palate, it draws similarities to the Brut Millésime 2005; lots of earthiness and mushroom character, typical features of the 1999 vintage. Everyone at the table made reference to the very soft acidity – which indicated to us that this will probably be drinking at its peak for the next two years and Cyril agreed. A magnificent rosé ready for drinking. Magnum really is the only way for Champagne of this age..
Really rich golden yellow colour. Some nice small bubbles still coming through. An incredibly alluring nose of mushroom and truffle. Lovely acidity still and immense power! Lime, mushroom and nuts galore on the palate. Great dryness and such impressive length. With more time in the glass, this is still very fresh. Wow! After an enjoyably educational journey through the delightful development of Blanc and Rosé Champagnes, there was one final matter to address – what the intriguing ‘?’ at the end of our tasting sheet was intended to represent. We weren’t held in suspense much longer as Cyril revealed the cherry on the icing of his Charles Heidsick Vintage Masterclass cake – a magnum of Brut Millésime 1981. Back in October 2014, Cyril – then senior winemaker at Veuve Clicquot – first initiated our obsession with large formats, telling us: “People expecting a bit more from a bottle of Champagne should upgrade to a magnum.” He proved his point with a comparative tasting of Veuve Clicquot Cave Privée vintages from the 70s and 80s served from bottle, magnum and even jeroboam (read more here). We haven’t looked back since, regularly promoting Champagne aged in magnum and hosting prestige tasting events of our own in support. So almost three years on, we’d come full circle; Cyril once again generously sharing with us an older vintage of a Champagne aged wonderfully in magnum. The house may have changed but the concept remains the same and this magnum of Brut Millésime 1981 was no exception. Tasting remarkably fresh and youthful for a Champagne almost 40 years old, it still had great acidity, power and incredible length. Upon revisiting after time left in the glass, we found it had developed new levels of complexity, the lemon and ripe lime flavours mixing with delicate white truffle notes and hints of nuts and dried apricots. Another great example of how well magnums age when stored in good conditions.